The site also conducted a Reader’s Poll Top 25, which varied from the “official” Gibson list. The readers voted in Iron Maiden‘s “Hallowed Be Thy Name” into the number one spot, followed by “Paranoid” by Black Sabbath in the number 2 spot. 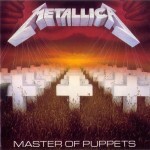 “Master of Puppets” came in at number 3 for the readers. The differing results from their reader’s poll made me wonder: What do the GeeksOfDoom.com readers think? Let us know what YOUR number one metal song is in the comments below!